I have also grounded my reset pin on my Arduino and when programming I ground the GPIO0 on the ESP-01 to enter flash mode. Not too sure if this would cause a problem but just wanted to note that my Arduino Nano is a clone and runs on the CH340G USB drivers not FTDI. It successfully uploads the program with the Arduino IDE but not much after that. I have also tried uploading the Blink program and the CheckFlashConfig program but the same error on startup. 0x40104bcd: wdt_feed at ?? line ? 0x40104bca: wdt_feed at ?? line ? 0x402177a8: user_uart_wait_tx_fifo_empty at ?? line ? 0x40104bd3: wdt_feed at ?? line ? 0x40104bb4: wdt_feed at ?? line ? 0x4022bea0: cal_rf_ana_gain at ?? line ? 0x40228690: tx_cap_init at ?? line ? 0x4022d4cd: ram_rfcal_pwrctrl at ?? line ? 0x4022d37c: ram_rfcal_pwrctrl at ?? line ? 0x4022be18: cal_rf_ana_gain at ?? line ? 0x4022be3d: cal_rf_ana_gain at ?? line ? 0x4022be9c: cal_rf_ana_gain at ?? line ? 0x40228689: tx_cap_init at ?? line ? 0x4022a600: chip_v6_initialize_bb at ?? line ? 0x40226237: phy_init at ?? line ? 0x40105eae: register_phy_ops at ?? line ? 0x4022b3b2: register_chipv6_phy at ?? line ? 0x4021a93e: wifi_station_set_default_hostname at ?? line ? 0x4022f660: sleep_reset_analog_rtcreg_8266 at ?? line ? 0x4010564a: spi_flash_read at ?? line ? 0x402174c3: rijndaelKeySetupEnc at ?? line ? 0x40217b3c: user_uart_wait_tx_fifo_empty at ?? line ? 0x40217b17: user_uart_wait_tx_fifo_empty at ?? line ? 0x40104e90: wdt_feed at ?? line ? Update: I have tried reinstalling AT firmware version 0.9.2.2 with esptool. Again it successfully detects the ESP-01 and programs it. I still get the same error (sometimes instead of getting boot mode:(3,6) I get boot mode:(3,7)) when powering up and I have tried to input AT into the Serial Monitor and I get no response. Browse other questions tagged arduino-ide esp8266 arduino-nano wireless or ask your own question. 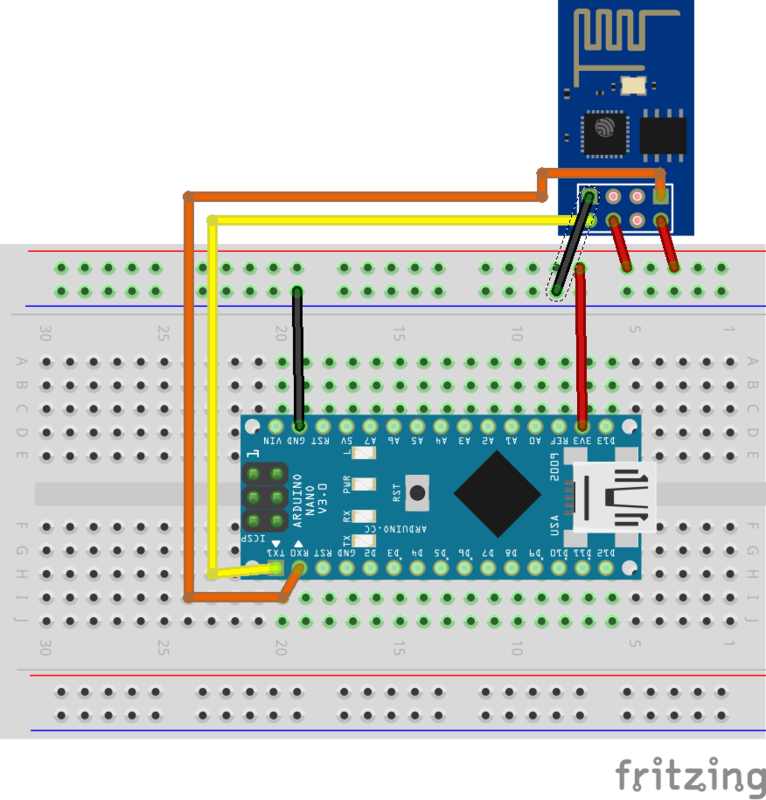 Arduino nano to esp8266 level shifting needed?